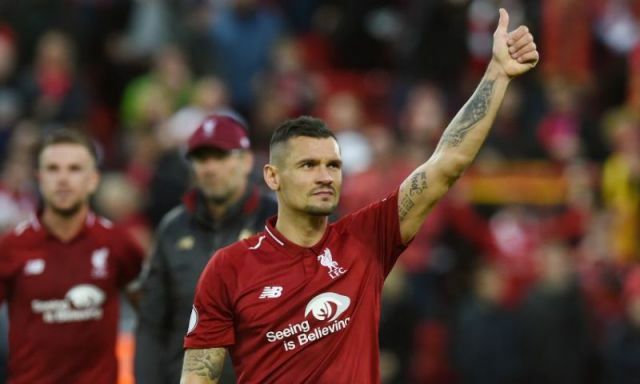 Dejan Lovren was initially named in the travelling party for Liverpool’s warm-weather break to Marbella, but due to complications with his injury, the club has decided to leave him at Melwood in a continued effort to get fit for the Bayern Munich tie in just seven days’ time. Jurgen Klopp today explained how he’s sweating over the Croatian central defender, who right now, doesn’t like like he’ll be ready for the Champions League tie. This is more problematic considering Virgil van Dijk is suspended, meaning Fabinho will have to partner Joel Matip in defence. “Dejan is not here and Joe [Gomez] is not here,” the boss told the official website. Fabinho playing in defence isn’t necessarily a problem – although Matip has never shown the leadership or communication to improve a partner alongside him like van Dijk does. We will miss the Brazilian in midfield, of course. We can see Klopp fielding Jordan Henderson as the holder, with Gini Wijnaldum and Naby Keita either side – with the usual front-three up top. Bayern are in much better form than they were when the draw was made, so without van Dijk, it’s going to be a very hard tie. The fact we’ve got the Dutchman back for the away leg is good, though. Perhaps a rest will do him good, considering he’s played every game in the PL and CL so far!